I love the fragrant aura of calm which incense brings. I knew silver incense burners existed and always hoped I would be able to make one in my own style. 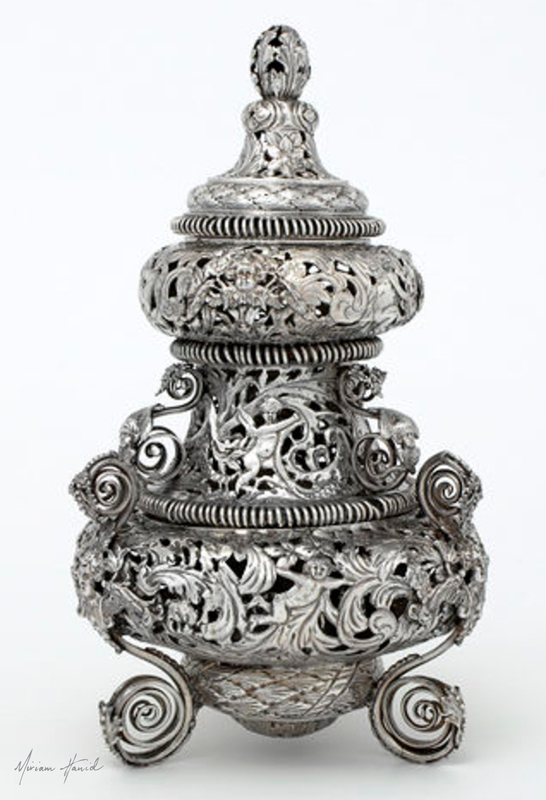 The opportunity to create a bespoke censer came as an indirect result of my Union Centrepiece (commissioned by The V&A in 2012) being exhibited in Hong Kong as part of ‘Masterpieces of British Silver: Highlights from The Victoria and Albert Museum’. Within the display, exhibited at the Liang Yi Museum, was a 17th Century silver incense burner on loan from the Rosalinde and Arthur Gilbert Collection. 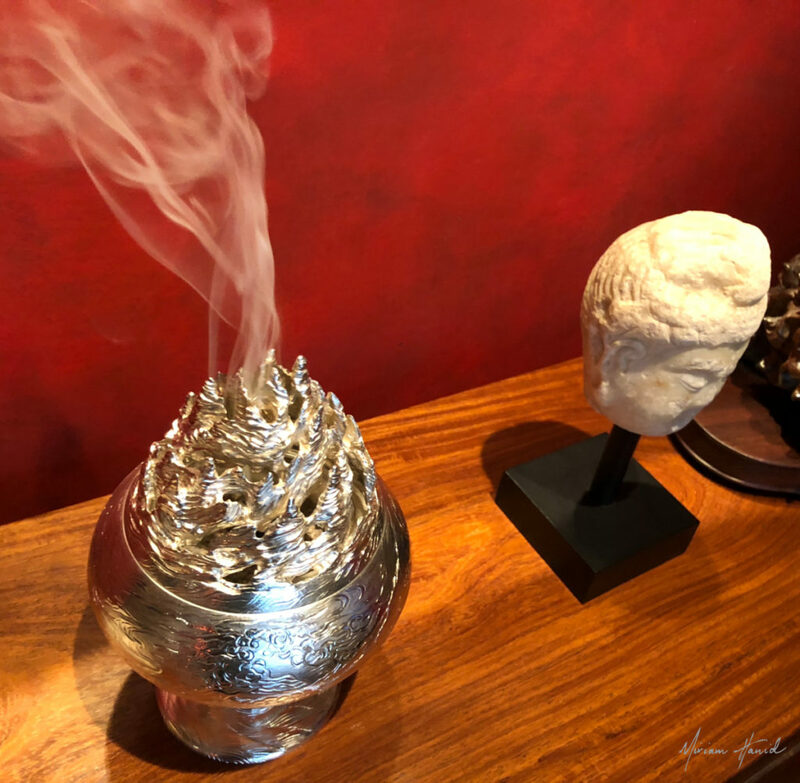 The client who commissioned my design saw this antique censer as well as my Union Centrepiece and this sparked the idea and a request for me to create a contemporary incense burner for his own use. The initial brief was for the chasing to include mountains, swirling clouds and waves, with birds and fish somewhere within the piece. As our conversations about the design developed, he also decided he would like to include a small fishing boat with fishermen somewhere within the waves. I found my research into the landscapes of China and Japan fascinating, and envisioned a design based on terraced rice paddyfields, rocky summits, waterfalls in the mountain foothills and also my signature style of waves within the mountain lakes. The element which ties these diverse elements together is water, so I sought to portray the invisible but outwardly manifesting water cycle in the chased areas of the piece. Rippling lakes morph into clouds by evaporation, tumbling onto the peaks and troughs of the mountainside landscape, cascading down through shining engraved waterfalls into rivers and streams wild with movement. 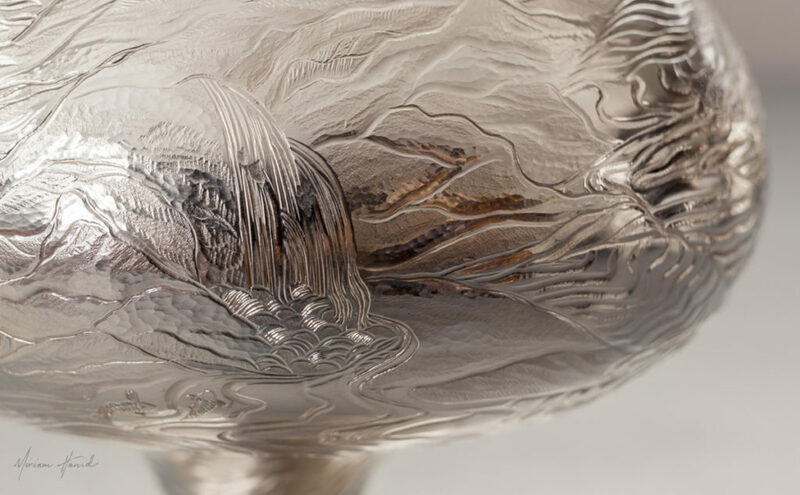 The never-ending ebb and flow of water continues down to the base of the piece, swirling around the stem – just as liquid would drain away – on its journey back to the sea. 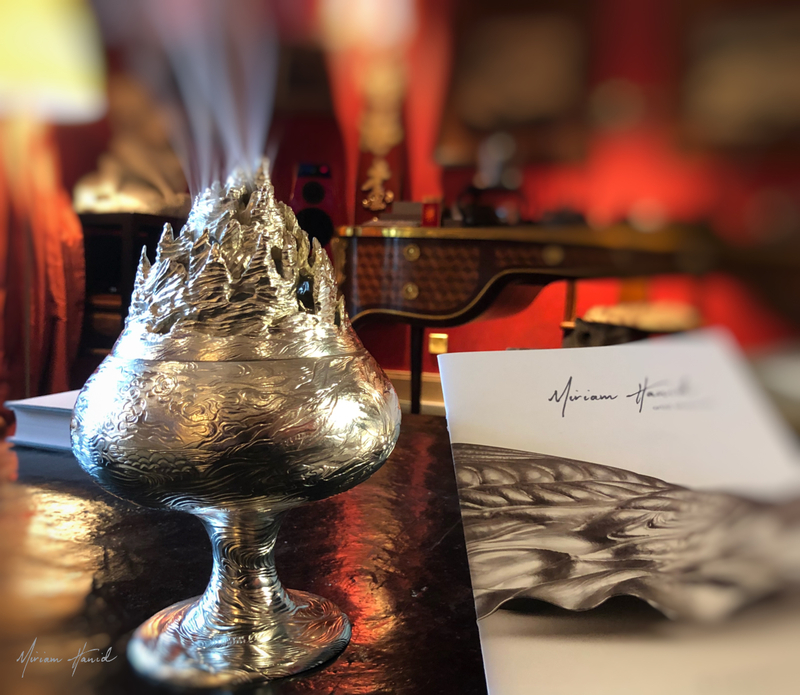 I experimented with hand carving to form terraced and craggy mountains to shape the burner’s lid, envisaging that this would enable the incense smoke to curl up and out of the holes within the carving rising off into the ether. I used a moulding putty called ‘magic sculpt’ to carve the mountain lid, which is mixed up in two parts and on curing sets hard ready to be filed, carved and sanded. 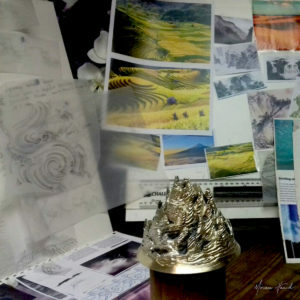 I used pendant motor steel cutting tools to shape the mountains. It took several days to achieve this essential element of the piece. 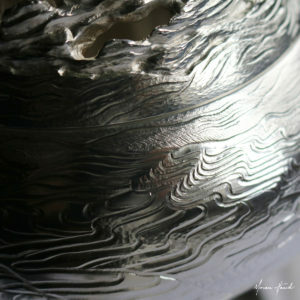 The work was then sent to a casting company which specialises in larger scale objects. They encountered issues trying to cast the mountain model in one piece, so had to cut it into five pieces. They then took rubber moulds of the various pieces separately, and put the mountains together again from the five wax pieces they created from the moulds. 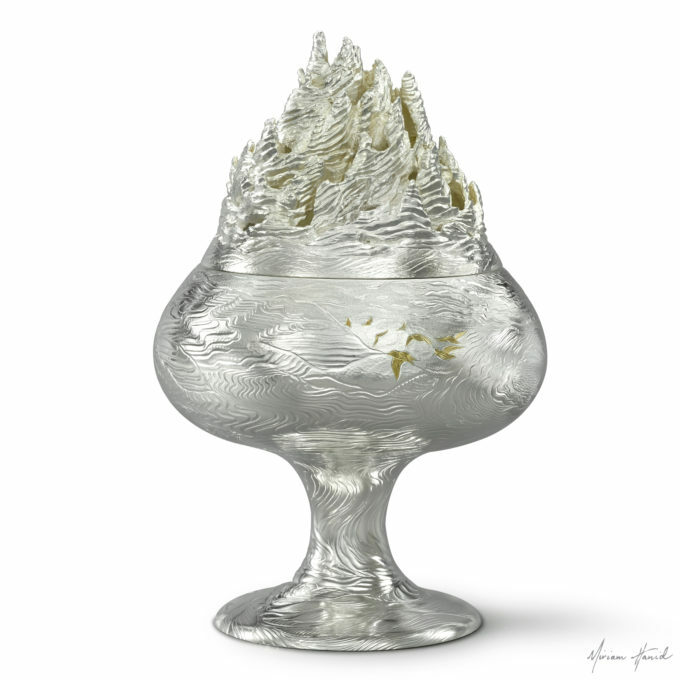 This proved a time consuming process and there was significant cleaning up to do on the model when I received it back in silver. 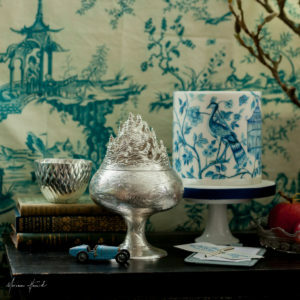 However I was pleased with the result and was thankful to the manager of the company for having persevered with it. 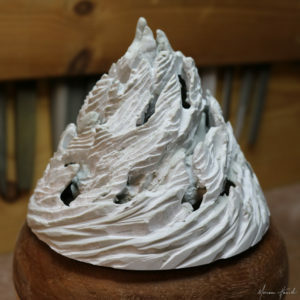 We had several long chats on the phone talking about various ways to cast the piece, and I was grateful that I didn’t have to re-make the mountain model after having spent at least a week building and carving it! While carrying out research for my chased design I learnt about Pacific Golden Plovers – amazing looking birds which stop over in Japanese rice fields in spring, during their 30,000 kilometre migration (sometimes not touching ground for eight days!) flying from Alaska across the Pacific Islands and on to Australia. I wanted to integrate the fish into the design in a meaningful way so I asked a Japanese jeweller friend Megume Toyakawa for advice. She told me about the ancient legend of the koi swimming up the waterfall which seemed to fit with the client’s request of fish within the design. The qualities of determination, strength and perseverance the koi are known for via the legend seemed to echo the experience of chasing the incense burner – it was a feat of endurance, stamina and perseverance for me. The shape of the piece was quite challenging to chase because of the narrow stem, and chasing at awkward angles made progress at every stage seem like a huge achievement! The client was thrilled with the piece which arrived in Hong Kong in early 2018. 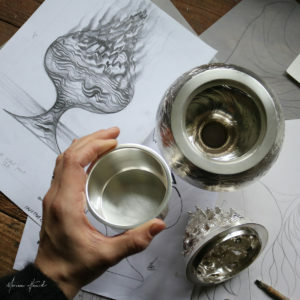 Describing the style of his home as “east meets west”, in his own words his first impression upon handling my work encompassed “The weight and the generous, clever use of silver. It is magical as the smoke of the burning sandalwood rises through the openings in the mountain top”. “The silver lights up the room and the burning incense makes the sitting room so aromatic”. 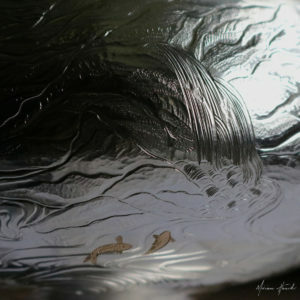 When I asked the client what he liked about the craftsmanship of the piece he answered “No doubt it is the chasing – this works really well with the waves of the raging river scene”, and he continued “It is a perfect mixture of poetic and musical lines with a bold application at the same time”. 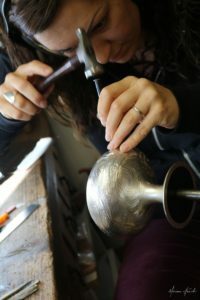 I was interested to know what it means to have one of my handmade pieces of silver in particular “Personal and wonderful. The fact that so much hard work and thought has gone into it makes it so much more precious”. I was thrilled to have this personal feedback. 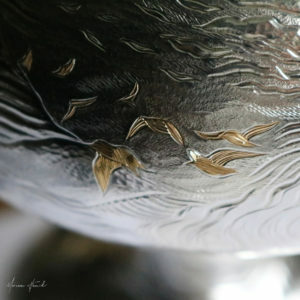 This reflects what I find so satisfying about commissions – I enjoy the whole process of exploration and research prompted by the client’s ideas and the way in which this then translates into a unique piece which encompasses its own narrative. The success of the piece is undoubtedly influenced by the client’s passion and enthusiasm during the process, which is a joy to be a part of. There is also the artistic journey which as with this piece leads me to stretch my technical and creative skills in new directions. The whole process combined is deeply satisfying a an artist. 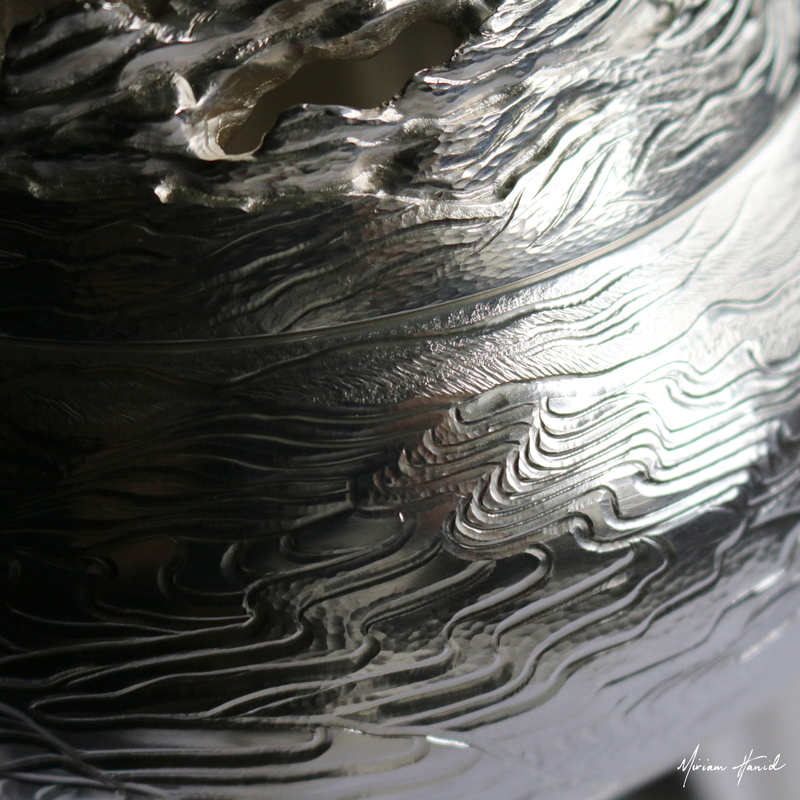 You might like to view my silver gallery to see my latest pieces, see my visual inspiration, learn more about the commissioning process, or visit the current exhibitions page. Last but not least, you are welcome to contact me with any comments, questions, enquiries about my work or even your own incense burner commission!